As a new mom, you probably have the highest expectations of maintaining close contact with your newborn. You are aware that the sacred first months will soon come to an end and therefore focus on optimizing on these precious moments. At the same time, you also have other duties to attend to which means that your hands would have to be free. Since your responsibilities still await you after child birth, you are left with no choice but to find an effective way of dealing with both. Having a good and comfortable baby carrier would allow you to keep your child at bay while leaving your hands available for multitasking. This is the most popular baby carrier brand in the ream and is often the first name that comes up when anyone mentions baby carriers. Aside from earning the gold winner accreditation, BabyBjonr carriers are of premium quality with a close attention to detail. The Swedish baby carriers also include an adjustable seat that guarantees the support of the baby’s hips. This carrier also features an extra thick padding that is strategically placed on the waist belt as well as the shoulder strap. The positioning ensures your comfort and that of your baby. 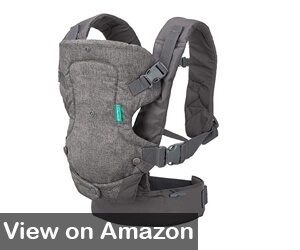 What’s more, this well structured carrier features a robust and highly flexible head support for your infant. Since babies grow so fast, the carrier features both front and back positions such that you can easily adjust to the view your baby prefers. The brand features various types of carriers that are tailored for different occasions. For instance, the Baby Björn One has an option of facing outside alongside buckles that allow you to quickly release the baby. The One Air type describes the lighter model of the carrier and is made completely out of mesh which increases its suitability for summer. The breathable design of the carrier also ensures that your baby remains cool even during hot weather. Both carriers allow your baby to snuggle on your chest, and to face them front or back depending on your preference. Unlike other baby carriers, you do not need a special insert to use it. Premium quality, with an effective hook-and-loop waist belt system. The carrier does not allow the baby to face forward. 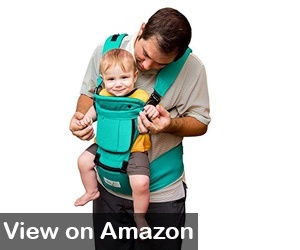 This baby carrier is popular for its increased versatility. The carrier allows you various baby carrying positions including the front, hip and the back. It also features a special opening that enhances ventilation, and provides sufficient cooling for the baby’s back. This feature guarantees the comfort of your baby during summer, or when you get into warm public spots such as the train. 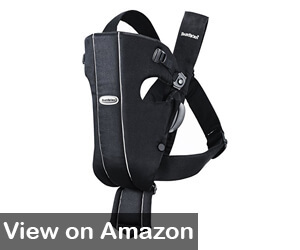 The baby carrier also gives you the option of buying the pack booster and a collar for infants. For the older babies that usually have high curiosity, the carrier allows you to carry them in the back. This is enabled by the booster which also enables you to share your baby’s view from their shoulder. Customers are impressed by the ergonomic design of these carriers and the thick-padded straps that increase your comfort. It is a premium, and well designed baby carrier. The innovative mirror guarantees your piece of mind. The innovative features of the mesh panel and mirror allow for comfort and peace of mind. The carrier is designed for occasional use which means that you cannot use it on a daily basis. This carrier is recommended for the parents that prefer the general feel of a fabric sling but are also seeking comfort and support. 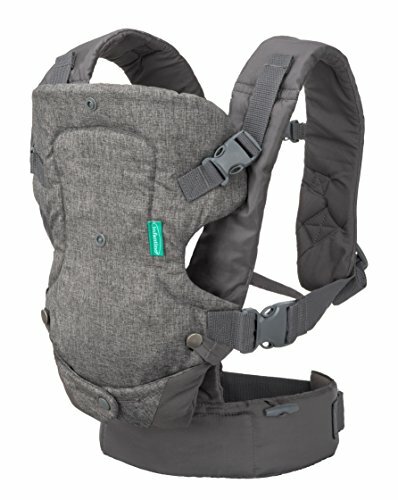 Izmi baby carrier is a silver winner, and basically describes a sling-oriented carrier hybrid. 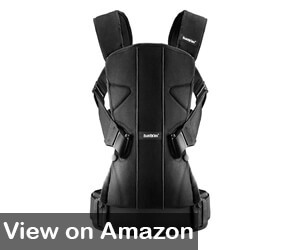 The baby carrier has comfortable and well padded shoulder straps as well as flexible head support for the infants. What’s more, this carrier features an adjustable seat that adjusts to match the size of the baby. It also features a booster cushion aside from allowing you to pack it into a small size that can easily fit into baby storage bag. Our bronze winner comes in the form of the Integra Baby, and promises a comfy fit for parents and babies who like to travel in style. It’s designed by Sarah Sadler, who knows a thing or two about carriers, having been a baby wearing consultant for 11 years. The ergonomic design has a soft waist, integrated hood, adjustable buckles for a close fit, and front and back carrying options. It comes in three different sizes for the perfect fit. Very simple to put on, and comfortable. Product is designed for a specific size making it more bespoke. It’s not made for heavy daily usage, just occasional use. This baby carrier was created by a team of a husband and wife who aspired to share the advantages of baby wearing to new parents. The brand is rapidly becoming a household name in the industry with customers praising it for its distinct features which include how easy it is to adjust it. 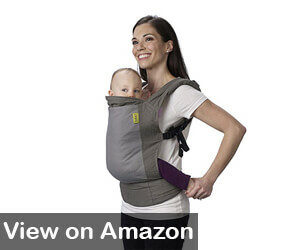 The straps of the carrier can be easily altered even while still holding the baby. It allows weights of between 3kgs to 2-kgs with high levels of comfort. 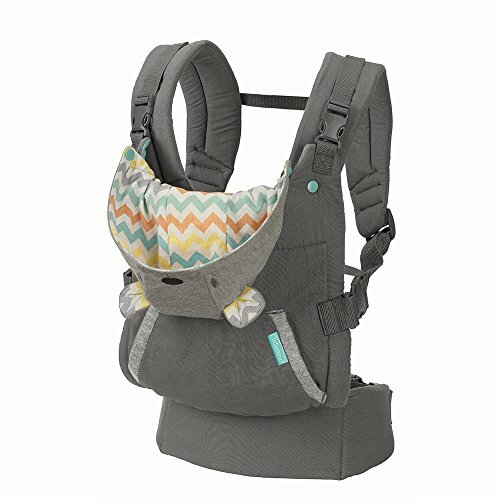 Other features of the carrier include a well padded waist band, and shoulder straps that allow the even distribution of the baby’s weight. These features ensure that your baby is ache free even after carrying him in the carrier for a long time. Might over heat in hot weather thus disrupting your comfort and that of your baby. The design of this carrier is extremely simple and is basically comprised of a piece of material and several straps. The simplicity in design has helped the carrier to receive parenting awards and was recognised in 2015 as the most borrowed baby carrier in the UK market. Customers are attracted by the compactness of the carrier which comes in handy when the carrier is not in use. You can fold it up into a small enough size that can fit into your bag. 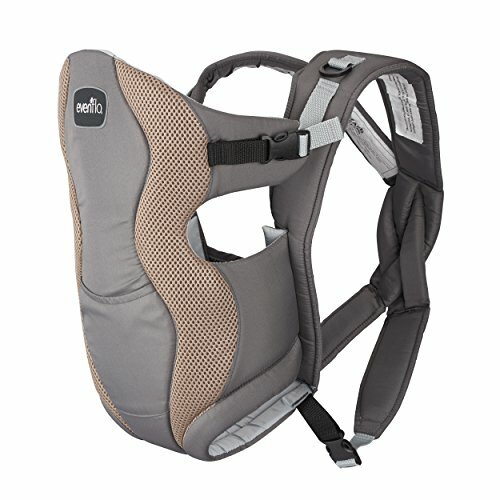 Other features that attract parents to the connecta baby carrier include its ease of use, and the options of carrying the baby on either the front or the back side. The carrier is ready to use at birth, without the need of a fiddly insert. The brand also offers the carriers in a broad range of designs such as stars, reindeers and unicorns to suite your personality and preference. All the options are made from organic cotton including the linings and the straps. Connecta baby carriers are generally stylish and practical. The in-built adapter increases its suitability for outside travel. The hard seat increases the bulkiness of the carrier. This wrap is made of 95 percent cotton and 5 percent spandex, which means it will have stretch and breathability. That makes it a great choice even on hot days. It is completely machine-washable so it if gets stained or if your baby nails it with a lot of spit up, a trip through the washing machine will clean it right up. This sling can hold up to 35 pounds and the product has a lifetime warranty. To help take the guesswork out of how to operate the sling, it comes with an instructional DVD. 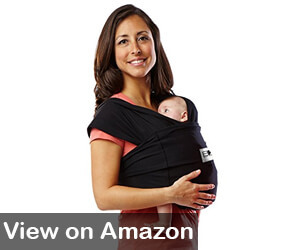 That will show you the different ways you can wrap your baby in this sling. It can be cleaned in the washing machine and can go in the dryer too. This baby carrier is made out of 100% organic cotton and is suitable for the moms that prefer to carry their babies against their chests and backs. 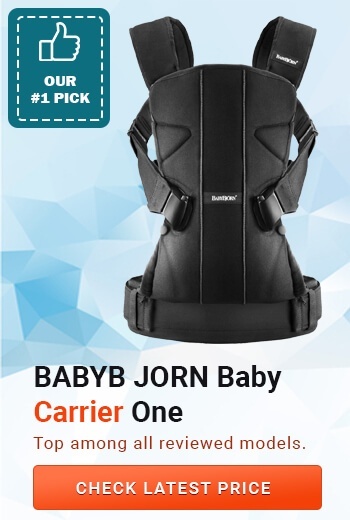 With this carrier, you have the option of carrying the baby in all conceivable ways since it features none distinct positions, that include the hip, front, back and the forward positions. The carrier guarantees the safety of your baby since it uses safety materials among them the zippers and buckles. What’s more, the shoulder strips of the carrier provide a lock buckle that adjusts in three different ways. Since the system is adjustable from the front and also the back, you are always within reach in case you wish to tweak the fit. The carrier allows you to carry the baby once they reach 3months until they weigh 40 pounds. To ensure sufficient coverage for your baby in hot weather, you can use the head cover that is made out of organic cotton. Aside from moms, dads would also like to carry their newborns in carriers too. This allows them to get the much needed baby to dad quality time. 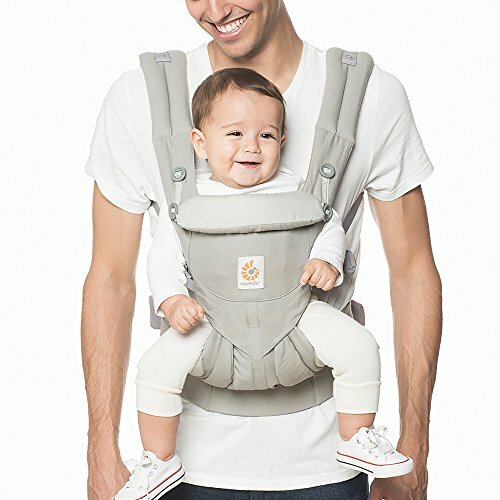 Since dads would not prefer the flowery patterns that are characteristic of the carriers preferred by moms, this baby carrier offers them a more masculine alternative. 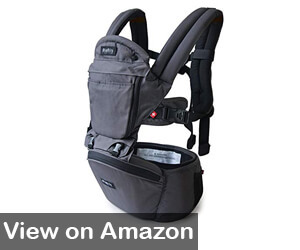 The general look of the carrier is more tactical which makes it more appealing to the dads. The design eliminates the worry of dads looking like they are adorning their wives’ carriers. It comes in a distinct black color with the option of being worn on the front and back sides. The carrier also features detachable pieces that are designed to increase the comfort of your baby. Other attractive features include support for the back, neck and head of your baby, as well as a hood that serves a protective function against bad weather. What’s more, the carrier features a front pocket that could be used to store items that need quick access such as a pacifier. This carrier gives you the general feeling that your baby is safe hands. The baby will also prefer the carrier because it provides them with the option of facing front or outward when they feel like looking at their surroundings. Made out of anti slip material that prevents your child from sliding. Your comfort and that of your baby is one of the most imperative features to look for when searching for a baby carrier. We recommend that you identify one that is made out of a breathable fabric that will reduce sweating. 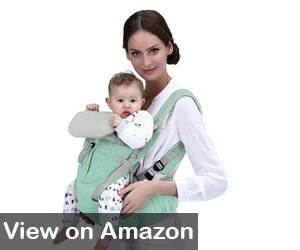 What’s more, you will also need a carrier that has sufficient padding which increases the carrier’s comfort, as well as a carrier whose zippers and strips will not rub roughly against you and the baby. While finding a carrier that is both comfortable and affordable might be an easy process, if the carrier is too complicated, it becomes worthless. For instance, you would have no use for a carrier that is hard to put on especially with the hormonal imbalances and cases of sleep deprivation that are common in new moms. Therefore, finding a carrier that is easy to use is among the most important things to look for in a baby carrier. Selecting a bad carrier is accompanied by higher chances of hurting your baby on the hips and the back. For new borns, you are advised to avoid narrow baby carriers that allow the legs of your baby to hang loose without a strong source. As a matter of fact, you would be in a much better position if you found a carrier with a wide seat. This feature would provide sufficient leg support for your baby. There is an old saying that holds that you get the value of what you pay for. This saying should remind you to look for valuable carriers that would be last longer than cheap ones. Market research reveals that the cheap carriers may disappoint you in terms of the zippers and the stitches. The price of baby carriers is broadly diverse. Although cost savings are among your highest priorities for a new parent, it is important to ensure that you do not compromise on quality since this would increase the overall price in the long term. Baby carriers are the preferred selection for the mothers that would like to multitask while maintaining a close connection with their baby. The carriers also reduce the strain of carrying the newborn which is an inherent disadvantage of carrying babies in the conventional way. Our review of the best baby carriers for your newborn baby includes a wide selection of products each with distinct features. The review can assist you to establish the most suitable carrier for your baby. Give your newborn the comfort and safety that they deserve and avoid the carriers that compromise their comfort by checking out the list of carriers outlined in this review.